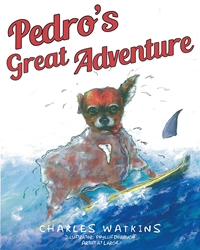 Recent release “Pedro’s Great Adventure” from Page Publishing author Charles Watkins is a delightful outing with a one-eared Chihuahua who smells like Chinese food and meows like a cat. Charles Watkins, a thrill-seeking outdoorsman who spends his retirement teaching martial arts, has completed his new book “Pedro’s Great Adventure”: a vibrantly illustrated tale about a little dog who has a big desire to live life to the fullest. Published by New York City-based Page Publishing, Charles Watkins’s lighthearted tale introduces Pedro, a red Chihuahua who has one ear and a mounting curiosity. A hungry tummy leads Pedro to try the peculiar yet mouth-watering smelling Chinese food leftovers his master accidentally left out. This gastronomic mini-adventure launches him into a quest to discover all of the other interesting things he has been missing out on by spending his days locked in the house. Pedro’s first day out leads him by bus to the beach where he fabricates his own surfboard and wetsuit, narrowly escapes a hungry shark, and gorges on fun park eats. Readers who wish to experience this amusing work can purchase “Pedro’s Great Adventure” at bookstores everywhere, or online at the Apple iTunes store, Amazon, Google Play or Barnes and Noble.